Tea garden workers in India abandoned by estate management are starving… Green tea appears to protect the prostate… crafty artists are making ornate flowers out of intricately folded tea packets. DARJEELING, West Bengal – Word this week of the starvation deaths of several tea workers at an abandoned tea garden was refuted by government officials who visited Raipur Tea Estate in Jalpaiguri district. Conflicting accounts and no formal autopsies leave the exact cause of death in question, but the incident has focused attention on the plight of up to 30,000 workers on 23 gardens abandoned in the past several years. Press reports, including the Times of India, last week described six deaths, including infants, but West Bengal Food and Supplies Minister Jyoti Priya Mallick, on Sunday toured the Raipur Tea Estate with North Bengal Development Minister Gautam Deb and said the deaths were due to disease and illness. Deb told the The Hindu “there have not been any starvation deaths in the tea garden. I have talked to the family members of six workers who recently died and they told me that they were suffering from illnesses such as tuberculosis and high blood sugar,” said Mallick. A physician on Saturday confirmed evidence of malnutrition at the garden where workers continue to pluck leaves without a wage. Like the 460 workers at Raipur there are thousands struggling toj survive on abandoned estates in West Bengal, Kerala and Assam. Tea plantations are mandated to provide shelter, medical care, food subsidies and a minimum wage but once abandoned the resources disappear. When a garden closes workers with skills operating a tea factory and those young enough to prune and pluck leaves simply move on leaving the weak and less skilled workers to fend for themselves. At Raipur workers continue to pluck leaves without drawing a wage to sell to bought leaf factories. On Sunday Mallick announced steps to improve the supply of subsidized rations to workers and awarded INRs 5000 ($83) to the families of the dead. A vigilance inspection was ordered at 20 other gardens, according to The Hindu. The distressed gardens failed during difficult financial times beginning in 2004, reopen periodically and fail. The government will also try to convince owners of the tea gardens to reopen them, according to Mallick but banks are unwilling to write off the millions in debts and new owners can bear to make good on bad loans and non-performing assets. The state of Kerala took a different approach, reopening many gardens that had failed mainly by permitting workers ownership. West Bengal had no such success. Kerala’s experience is powerful testimony to the important work of training smallholders to strike out on their own. Last week the Ethical Tea Partnership and IDH – the Sustainable Trade Initiative announced a very successful pilot program of outdoor classrooms that has trained 48,000 Kenyan smallholders to improve their agricultural skills and to process tea. ETP announced a coalition of major tea companies would expand the program to 200,000 smallholders in Africa and Asia’s tea growing countries within the next three years. ETP’s hands-on training in irrigation, composting, plant nutrition and protection from insects has increased yields by as much as a third. The Kenya Tea Development Agency (KTDA) supports the program through 1,600 Farmer Field Schools. 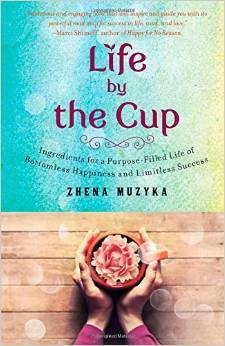 “Tea provides a livelihood for millions of people around the globe. These projects show that the industry is committed to helping smallholder farmers and workers earn a decent wage and farm better, and that it understands that this is fundamental to building secure supply chains and future success,” said ETP Executive Director Sarah Roberts. Targeted nations include Malawi, Uganda, Rwanda, Tanzania, India and Vietnam. The effort is funded by multi-nationals that include Unilever and Tata Global Beverage and Taylors of Harrogate producers of Yorkshire Tea. The Confederation of Indian Small Tea Growers Association (CISTA) is seeking assistance similar to Kenya and Sri Lanka to ensure better execution and monitoring of various tea production and promotional schemes. It will also help initiate a pilot program to develop an alternative market for small tea growers, according to The Hindu Business Line. This, in turn, will help small tea growers produce better quality green tea leaves and ultimately upgrade themselves from mere green leaf producers to made-tea producers, according to the CISTA release. In London delegates to the annual TEAm Up conference acknowledged it will take more than government programs to resolve key social and environmental issues affecting the sector. ETP and IDH, joint hosts of the event, updated producers, packers and retailers on the progress of their pioneering projects and explored how action to tackle them can secure supply chains and build brands’ reputation. The American Cancer Society projects that 233,000 men will be diagnosed with prostate cancer in 2014. It is the most prevalent type of cancer in men after skin cancer, affecting one in seven men in the course of their lives. Given tea’s reputation as a healthful beverage with powerful antioxidants, it is not surprising that researchers would be considering the potential impact of green tea on prostate cancer. A new report published by “Metabolomics”in May 2014 found that epigallocatechin-3-gallate (EGCG), a catechin in green tea, may affect the work of one of the enzymes that powers cancer metabolism. In many cancer types, the enzyme Lactate dehydrogenase A (LDHA) is present in elevated amounts. LDHA affects the way that the chemical compound pyruvate is processed. Pyruvate is produced in glycolysis and would typically continue to metabolize, giving the body’s cells energy. When cells lack the oxygen they need, pyruvate is instead converted to lactate because of the presence of the enzyme LDHA. Elevated LDHA keeps a process going that feeds the growth and survival of the tumor and also promotes the migration of the cancer cells throughout the body. It is suspected that if LDHA can be targeted, the growth of the cancer cells may be slowed. Researchers believe that treatments that impact LDHA may be important in future therapies. The National Institute of Health reports being involved with five current trials related to prostate cancer and green tea extracts including studies on early stage prostate cancer, men having radical prostatectomies, and patients with low-risk cancers. Source: Metabolic consequences of LDHA inhibition by epigallocatechin gallate and oxamate in MIA PaCa-2 pancreatic cancer cells, Metabolomics, Lu, Qing-Yu; Lifeng Zhang, Jennifer K. Yee, Vay-Liang W. Go, and Wai-Nang Lee. Accepted for publication May 2014. 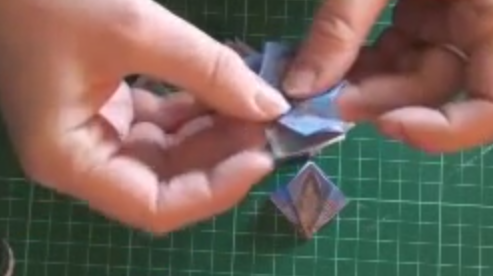 Here is a clever challenge for crafty tea drinkers who like origami. 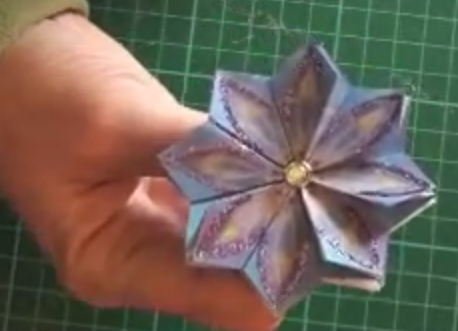 This video shows how to fold square tea wrappers into pinwheel like flowers. Paper Printables shows you how to make a cute little paper star from just 8 tea bag sized bits of paper. Super easy and novel greeting card or gift wrap embellishment. Just download a beautiful tea bag design from http://paperprintables.com/ and get folding! TEAM UP participants in London last week presented a program to raise wages for tea workers… Nestle is withdrawing its Nestea bottled products from China… India tea production fell 24.5% in April…the Fill’er Up unlimited drink app CUPS makes it debut in New York City. TEAM UP is an annual gathering of tea professionals hosted by the Ethical Tea Partnership and IDH The Sustainable Trade Initiative in a coalition that includes OXFAM and the German Development Agency GIZ. Combined these organizations are seeking to remedy the issue of low pay on tea estates in several developing countries. Many tea producing countries are so poor that legally mandated minimum wages not enough to give tea workers a living wage. While tea estates that pay their workers the legally agreed amount it is not sufficient to covers a household’s basic needs, explains ETP in a release following the event. Work will focus initially on Malawi, Africa’s second biggest tea producer, where pickers earn two thirds of the World Bank poverty line income of around $2 per person per day. It is a small sum but tea workers are better off than 62% of the population, who exist on less than the World Bank’s extreme poverty line of $1.25 a day. The coalition aims to help tea estates improve their productivity and profits and make more finance available to invest in improvements in return for a commitment to raise wages. They will also work with employers, unions and governments to agree phased improvements to wages – which are set at national or regional level – and increase worker representation in negotiations. The program will run for several years and inform similar work to raise wages in other countries. Nestle first introduced its bottled tea in China in 2002, a program jointly backed by Coca-Cola known as Beverage Partners Worldwide. Coca-Cola had previously attempted to market Tianyudi tea and a honey tea called Lanfeng. Neither survived. It was thought the combined marketing efforts of the global beverage giants would make Nestea a success in competition with China’s Master Kong and Taiwan’s Uni-President brands. 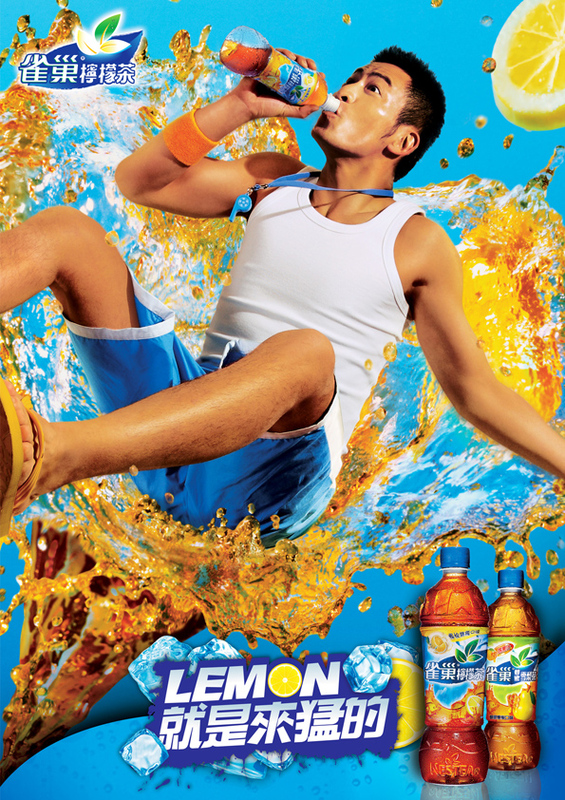 According to an article in the Chinese publication Want China Times, Nestea’s market share peaked at 2.3% in 2008 according to Euromonitor International figures dropping to 1.9% in 2010. This led to Nestle and Coca-Cola’s decision to go their separate ways in China in 2012, with the Swiss company taking over the operations of Nestea in the country, while Coca-Cola focused on its Yuan Ye tea brand. According to the latest report on China’s tea drink market published by Askci Corp, Master Kong and Uni-President now hold a combined market share of over 40%, reports Want China Times. Data from the early harvest have been compiled and declines due to the lack of rain were steep as projected. Production in April declined 24.48% to 56.77 million kg due to lower output in Assam and other regions, according to a report in the Economic Times. The production stood at 75.17 million kg in April 2013, according to Tea Board data. Output in Assam, the largest tea-producing state, decreased by 40.34% to 25.33 million kg in April this year from 42.46 million kg a year earlier. However, in West Bengal, production was up by 21.58% to 13.41 million kg during the month, from 11.03 million kg in April 2013. The combined production of tea in the southern states of Tamil Nadu, Kerala and Karnataka decreased by 18.41% to 16.53 million kg from 20.26 million kg in the year-ago period. India’s tea production in 2013-14 increased by 6.19% to 1,205.40 million kg from 1,135.07 million kg in 2012-13, according to Tea Board of India. An Israeli software developer has teamed with 40 independent tea and coffee shops in New York to launch a new subscription phone app good for unlimited drinks for the month. A $45 subscription covers as many cups as you wish of tea and regular coffee in any size. Upgrade to $85 and users can enjoy unlimited lattes, iced coffee and espresso drinks. Alternately you can opt for a variable X-cups for $Y dollars fixed price (5 cups $7 for example). You select your location. Select your drink and present your phone to the cashier. The cashier enters a payment confirmation code. There is no cost for the shop to join and no point-of-sale integration. It is not a traditional loyalty program, more of a marketing strategy to bring new drinkers into your shop. Co-founder Gilad Rotem anticipates 200 NY shops will participate as the program advances. Shop owners are paid a discounted rate for every cup purchased by customers using their phone. The fine print requires customers to wait 30 minutes between purchases and prevents them from sharing a login with their friends. CUPS has been operating in Israel since 2012 after Rotem and four of his high school buddies came up with the idea. The same holds for tea. Harney & Sons founder John Harney. Specialty tea pioneer John Haney died Tuesday. He was 83. The founder of Harney & Sons in 1983, his contribution to the development of America’s specialty tea industry can hardly be overstated. He entered tea retail late in his life following a successful career that made his encore all the more spectacular. Harney was known for his gentility and impeccable taste in tea. A master blender, his teas drew praise from the palaces of England and raised the profile of the entire industry. “No man ever graced his profession more than John Harney has done for ours,” author and friend James Norwood Pratt told the audience in 2011 on the occasion of Harney’s acceptance of the Cha Jing Award for Lifetime Achievement in tea. 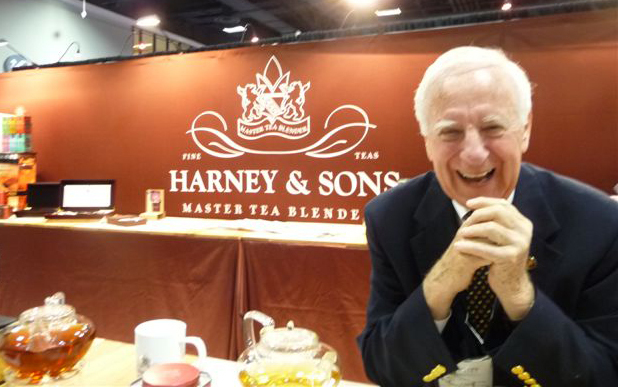 Thirty years ago Harney began spreading the culture of tea, he said, because in doing so “we’re spreading the business of tea.” With his sons Paul and Michael and grandson Emeric, Harney embraced and mastered all aspects of the business. His blends are best sellers in grocery and fine food stores and exported and sold worldwide including Buckingham Palace and the Grand Dorchester Hotel. His ready-to-drink line is served in fine restaurants and his loose leaf draws a steady crowd to the retail venture in SoHo managed by Emeric. Recently he produced a line of tea in capsules for Keurig brewing machines. 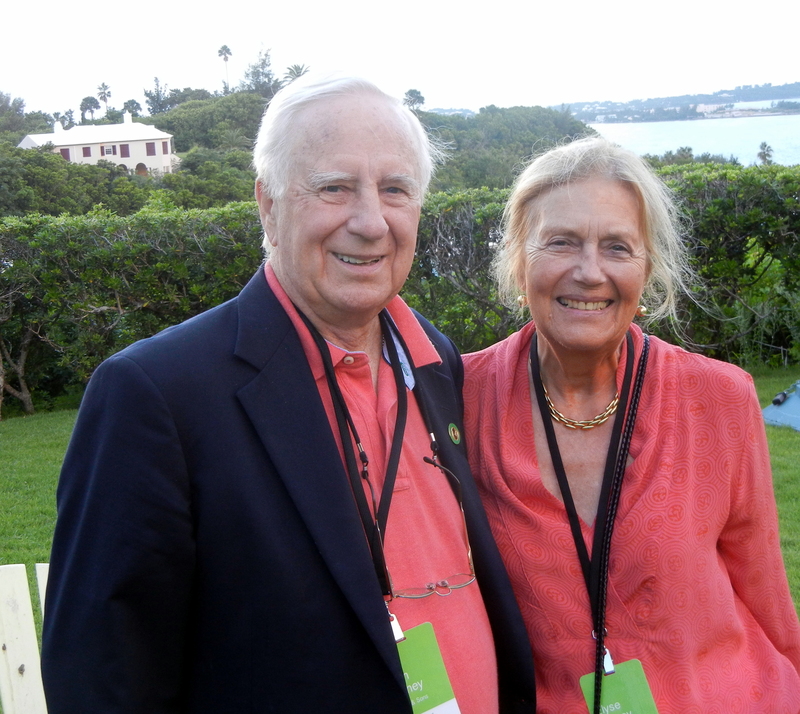 John and Elyse Harney, Bermuda, 2013. Innovation was a hallmark yet the brand reflects the tradition and manners of traditional tea. In 1960 he managed the historic White Heart Inn, in Salisbury, Conn., mastering the art of hospitality. It was then he fell for tea serving loose leaf supplied by Sarum Tea to guests in the 1960s. In 1970 he joined Stanley Mason, owner of Sarum, working there until Mason’s death in 1980. Three years later at 53, he launched his namesake company. The business has since grown to 170 people and occupies 90,000 sq. ft. of warehouse space in Millerton, NY. A new bottling facility is under construction. The business will continue under the direction of sons Michael, 58, and Paul, daughter-in-law Brigitte and grandsons Emeric and Alexander. Harney served in the U.S. Marine Corps. and graduated from the Cornell School of Hotel Management. He is survived by wife Elyse and five children John Jr., Michael, Keith, Elyse and Paul, and 10 grandchildren. The funeral was June 20 at St. Mary’s Catholic Church. 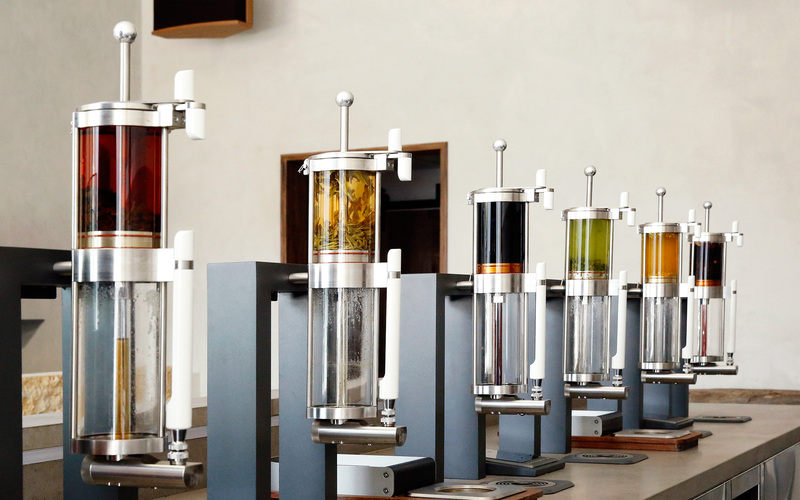 Burial was in St. Mary’s Cemetery, Lakeville, Conn.
A row of tea infusion crucibles at the new Samovar Tea Bar in San Francisco. Samovar Tea Bar launches a new tea retail concept worth watching…Honest Tea sells its billionth bottle… George Jage, founder of World Tea Expo, exits… Barak Obama sneaks out for a cup of tea. 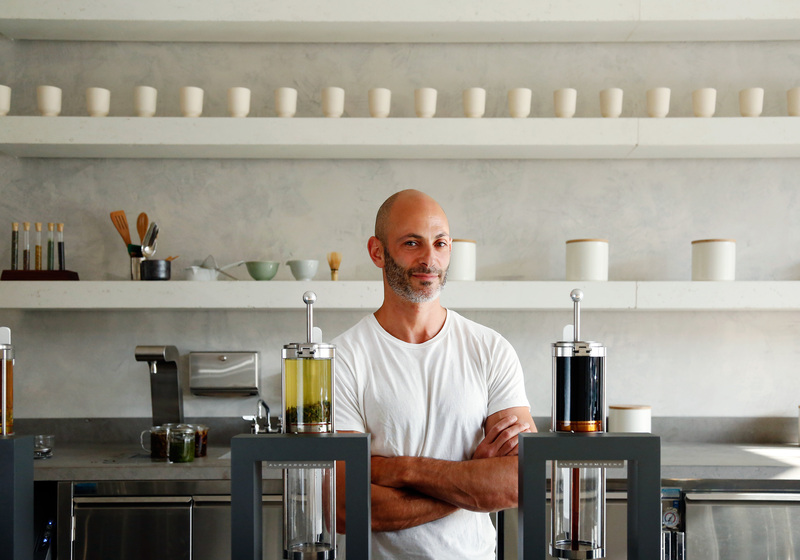 SAN FRANCISCO, Calif. – Jesse Jacobs, founder of Samovar Lounge last week unveiled a new tea retail concept that bears watching. The Samovar Tea Bar, located at 411 Valencia St., advances the idea that takeaway tea can be fast, inexpensive and every bit as trendy as a “third-wave” coffee shop. The brightly lit, open layout (designed by Arcanum Architecture) resembles an Apple Store. The 600 sq. ft. storefront requires a small staff. The only food on the menu are scones available in savory or sweet with jam or honey. The most significant innovation, however, is a line of what Jacobs calls “crucible” brewers built into the service counter. This puts customers directly in front of sommeliers wearing aprons who measure the tea, place it in the glass chamber and then press a touchscreen to fill the crucible with hot water, agitate and infuse the tea. Elapsed time is a couple of minutes with the tea decanted into a pitcher and poured into a cup. In a flash Jacobs demonstrates all the captivating interaction of a single-pour barista with a healthful beverage delivered faster than coffee. The machines make quite an impression. Manufactured by Salt Lake City-based Alpha Dominche they sell for $15,000. Khristian Bombeck, founder and inventor at Alpha Dominche, designed the Steampunk 4.0 with a computer to control a wide range of specific parameters, such as water temperature, agitation and water pressure as well as three grades of metal filters to reproduce a range of brewing methods. An added benefit of the system is that it’s programmable, allowing staff to recreate these parameters at the touch of the screen. This also means that the Steampunk requires only minimal operator training. The shop is frenzied urban friendly with six teas priced between $3 and $5. These include a black, green and herbal and a matcha shot or shake. Seasonal options include an iced tea. A copper cauldron of chai makes it possible to get a cup of tea as quickly at Samovar as from the famous chaiwalla street vendors in Calcutta. The tea bar is open from 7 a.m. to 7 p.m. in a part of the city known for exceptional coffee shops like Four Barrel Coffee just up the street. Expect it to draw a crowd. LONG BEACH, Calif. – Tears and toasts marked the departure of George Jage as the organizer and host of World Tea Expo, the most vibrant of North America’s tea gatherings. 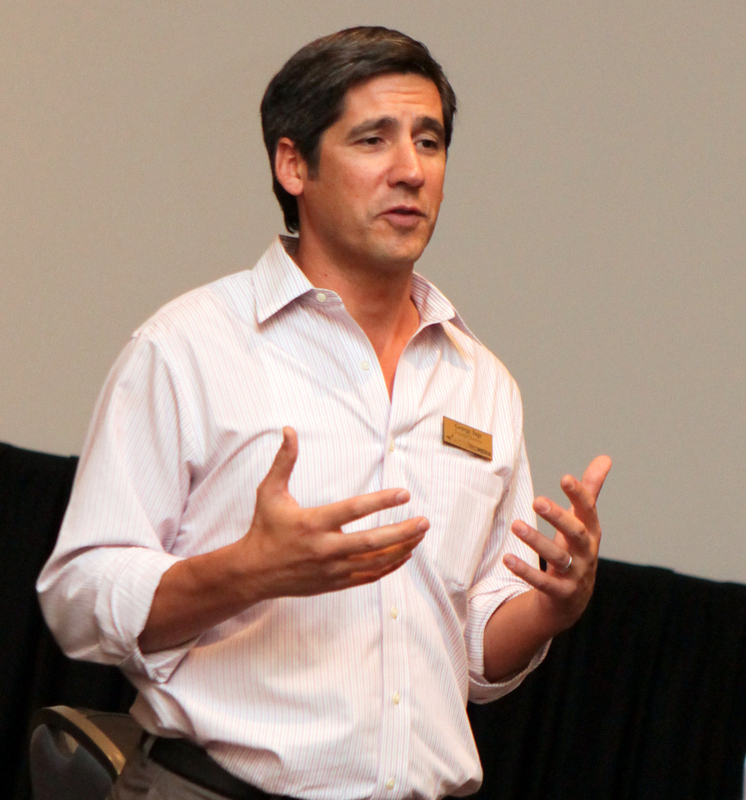 Jage, who co-founded the annual tradeshow in 2002, will lead CannaBusiness Media, a Colorado-based publishing and event company serving the medical marijuana trade. CannaBusiness is a division of Anne Holland Ventures, Inc., headquartered in Pawtucket, R.I. Publications include the Marijuana Industry Directory, Marijuana Business Daily and the annual CannaBusiness Money Show. His last day at F+W Media was June 11. George Jage is moving on. On the Saturday ending the show a crowd of friends and family filled the office during the final hour of the World Tea Expo. A portable bar appeared as the show floor closed and Jage announced his departure to the crowd of exhibitors with wife Kim and their two children nearby. The outpouring of emotion that followed was spontaneous. There were testimonials and tearful goodbyes, a blend of sorrow and light-hearted ribbing about his new position. Devan Shah, who invested more in the Expo than any other sponsor, told the crowd that Jage’s role in organizing World Tea Expo was indispensable in the development of America’s specialty tea industry. James Norwood Pratt extolled Jage for his commitment and charm. Jane Pettigrew offered her congratulations and Suzette Hammond, Director of Education & Brand Communication Strategist at Rishi Tea, was so tearful she could only give him a hug. Kim Jage watched proudly. She departed the company in October 2013. Jage, President & Publisher at CannaBusiness Media,quipped that he intends to take his next assignment “to new highs.” The job is a perfect fit, it is as though I have been preparing for this position for years, he said. He and his family will remain in Las Vegas. Sales of Honest Tea passed the billion bottle mark last week, an accomplishment that took 16 years. Astounding when you consider the company launched 85 different beverages under the label and bought 22 million pounds of organic and Fair Trade Certified ingredients to accomplish this feat. “Sixteen years ago, it almost felt like I sold every bottle myself. It’s nice to see our brand and mission reach an audience well beyond my personal sales route! 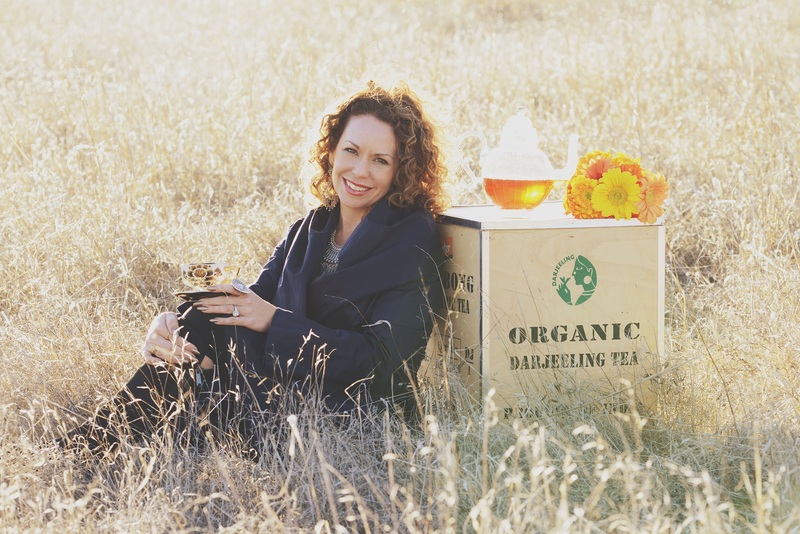 This is a testament to the persistence and faith of our team as well as the increasing acceptance of organic ingredients,” said co-founder & TeaEO Goldman. It took 10 years to sell 112 million bottles. Following the company’s acquisition in 2011 Honest Tea became available in 100,000 outlets. In the past six years sales grew by 888 million bottles. 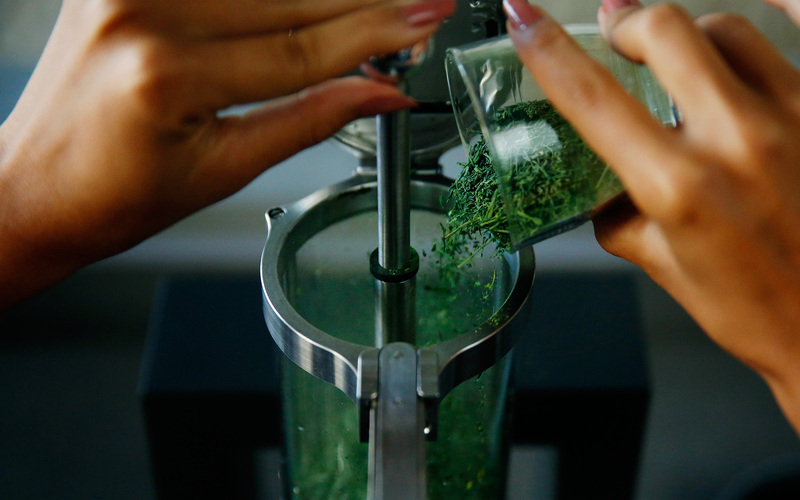 The company now buys 8 million pounds of organic ingredients a year, most of it tea. President Barak Obama dashed from his Washington DC residence last week to visit a Starbucks on Pennsylvania Avenue, bypassing the media pool. He was accompanied by White House Chief of Staff Denis McDonough and armed guards. He spent about eight minutes in the shop. “It’s tea,” the president responded. The media subsequently ran 1,535 articles on the encounter. We should all be drinking iced tea this week in celebration of National Iced Tea Month and out of necessity as temperatures climb… Starbucks debuts an iced tea commercial promoting Teavana shaken tea (with a national tea giveaway Tuesday)… Nestea positions for a comeback… the final count is in on India’s 2013 harvest… and coverage of this year’s World Tea Expo in Long Beach, Calif. This time of year dusty Kansans like me will drive to a convenience stop, race to the dispenser and gulp a giant iced tea without asking about price or refill policy. Unlike sweet tea drinkers in the Deep South, Midwesterners prefer to sweeten their tea with a teaspoon of sugar instead of a quarter pound scoop. Lemon optional. It is the blast of cold in the belly and the thirst-quenching astringency they seek. Tea is a beverage enjoyed by more than one half of America’s population on any given day. According to the Tea Council in 2012, Americans drank more than 3.6 billion gallons of tea – enough to fill the Empire State Building more than 13 times. Since 85% of the tea Americans drink is iced, the U.S. celebrates a love of this healthy beverage every June with National Iced Tea Month. Lately I’ve noticed that restaurants are making a lot better tasting iced tea. Thirty years ago I shunned the movement to mask the anemic qualities of restaurant tea with raspberry and strawberry and peach flavoring. Instead I’d request a pot of hot tea with two bags and a tall glass filled to the brim with ice. I would patiently brew the tea double-strength and pour it over the ice, diluting it nicely as it chilled. The fresh brew flavor was like home but the tea bag blends were typically stale. 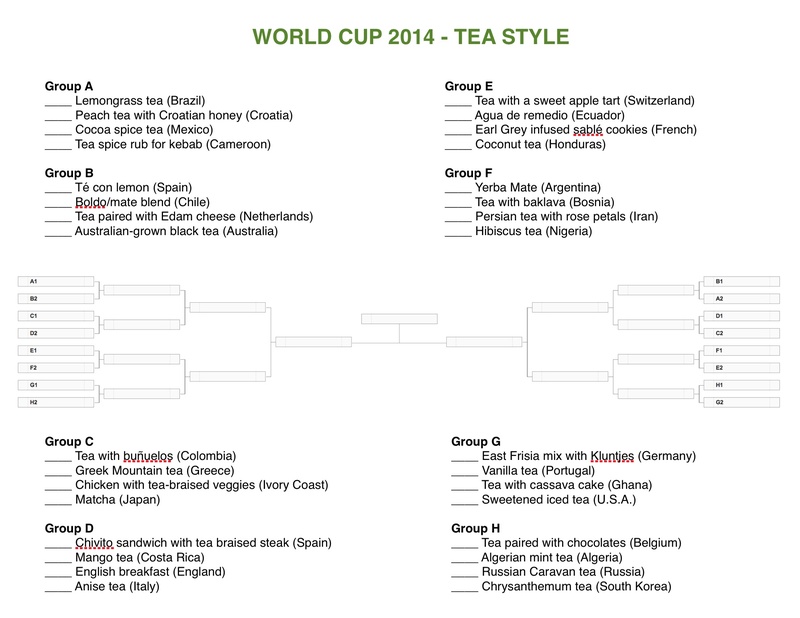 At home I use a full-bodied loose leaf Ceylon or a malty Assam brewed in a Takeya flash-chill pitcher of ice. No sugar needed. Sometimes I drink three quarts a day. The other day I was dining at a highly-rated Seattle restaurant that uses the fresh-brewed, flash-chill technique and I got to gulping. “Will you bring another,” I asked the waitress… “and another”… “and another.” This was a Sri Lankan Ceylon from Barnes & Watson made like I do at home. The guys at Wilbur Curtis noticed the trend. When I spoke to them at World Tea Expo they said restaurants are filling the company’s foodservice iced tea dispensers with several pounds of ice and then brewing the tea extra strong. The tea is then released into the ice-filled dispenser to flash chill. In April I was interviewing Janaki Kuruppu who chairs the Sri Lanka Tea Board. The topic shifted to iced tea and she revealed a strategic effort to promote Ceylon as an iced tea supplier in the foodservice segment. I assured her Americans are ready for a full-bodied, brisk flavored single-origin thirst quencher. Teavana stores nationwide in the U.S. and Canada will offer one free small serving of brewed Raspberry Limeade Iced Tea to each customer who makes a purchase in a Teavana store or Teavana Fine Teas + Tea Bar. 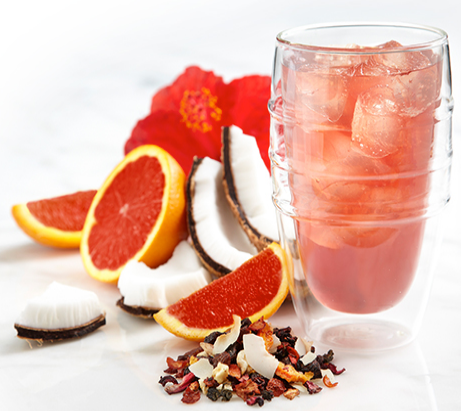 The new Raspberry Limeade Tea, available in Teavana stores today, is Teavana’s unique take on the summer favorite of raspberry limeade. Click for details. * Sweepstakes rules. Forbes last week published an article on renewed efforts by Nestle Waters to revitalize its Nestea brand. Two years ago the company invested in Sweet Leaf Tea and Tradewinds bottled tea. The Nestea brand was once the king of the cooler until Lipton and Arizona seized the shelf space in most convenience outlets. Nestea’s Rick Tanner, vp of marketing for Nestle Waters, told Forbes that the worldwide restructuring with Coca-Cola allocated Nestea to his portfolio: “We think Nestea is going to be the big driver. It’s got 95% awareness but little consideration,” he said. “Arizona really redefined the category about 12 years ago and caught Lipton and Nestea sleeping,” said Tanner. The company is releasing a new TV commercial updating the familiar “Take the Nestea Plunge” slogan. “We expect to do a lot in the space of digital engagement around the plunge and work with key partners such as Facebook, Google and a few others to leverage the Nestle global partnerships we have in the digital and social media space,” he said. The Long Beach location was great and World Tea Expo once again demonstrated the collegial affability of global tea. Attendance was 4,600 with tea lovers from 50 countries in the aisles and about 200 exhibitors on the floor. The program was enriching with returning favorites including Jane Pettigrew, Thomas Shu and James Norwood Pratt, Bruce Richardson, Anupa Mueller, David Walker, Rona Tison and Dan Robertson with lots of new ideas from speakers including Peter Marino, Shabnam Weber, David De Candia, Emeric Harney, Elyse Petersen, Naomi Rosen, Robert Wemischner and James Oliveira. Download the sessions on tea marketing with David Sprinkle (Packaged Facts), Lynn Dornblaser (Mintel International) and Jonas Feliciano (Euromonitor International) along with the Health Beverage overview by National Marketing Institute’s Steve French. 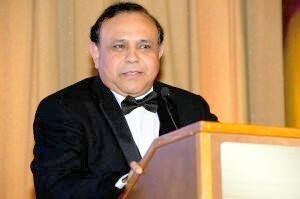 LONG BEACH, Calif. – Specialty tea import pioneer Devan Shah basked in the warmth of praise and standing applause of his peers at a black-tie ceremony on board the Queen Mary, tearful in gratitude before family and friends. In accepting the Cha Jing Lifetime Achievement Award at the 2014 World Tea Expo, Shah spoke of his heritage in the tea lands of India and the remarkable opportunity America presented 25 years ago on the founding of International Tea Importers (ITI). His lifetime commitment to tea education and innovation was detailed by author James Norwood Pratt who cited the creation of the Chado Tea Rooms, the Los Angeles International Tea Festival and that fact that Shah was perhaps America’s most influential champion of chai. “Everyone knows black tea is the most popular tea here and that green tea is second, but few recognize that it is Devan who made chai the third most popular tea in America,” said Pratt. Shah has financed books, sponsored seminars and exhibitions, given talks and presentations and hosted countless tea samplings at events that led others to the discovery of fine tea. “Shah has extended his love of tea to thousands,” said Jage, who presented the crystal trophy. Against life-size images of his activities projected on the big screen in the stately Queen Mary Salon, Shah humbly thanked the crowd, his daughter and immediate family and the many relatives who traveled from his beloved Nilgiris to attend the banquet. The Cha Jing Lifetime Achievement Award (#ChaJingAward) recognizes and celebrates individuals who have made considerable contributions to the growth, innovation and education of the specialty tea industry throughout their lifetime. Shah received toasts well into the night in the celebration that followed on the observation deck of the historic ship. Ten presentations preceded the awarding of this year’s Cha Jing recognition in categories that follow. George Jage and Gail Gastelu, publisher of the The Tea House Times introduced winners following a tally of several thousand online ballots by attendees. Best Tea Spirit: James Norwood Pratt, tea author and expert, San Francisco, Calif.
Best Tea Publication: TeaTime Magazine, Birmingham, Ala.
Best Tea Room Website: The St. James Tearoom, Albuquerque, N.M.
Best Tea Room Menu: Samovar, San Francisco, Calif.
Best Tea Retail Website: Adagio, Clifton, N.J.
Best Tea Blog: World of Tea, Chicago, Ill.
NEW DELHI, India – Final figures for the 2013 harvest reveal an increase of 6.19% to 1.205 billion kilograms, up from the 1.135 billion harvested in 2012. The India Tea Board reports combined output of Assam and West Bengal and other north Indian states increased 7.56% to 960.96 million kg. The two states grow almost 80 percent of India’s tea. Production in the southern states of Tamil Nadu, Kerala and Karnataka rose to 244.44 million kg last year, up slightly from 241.69 million kg produced in 2012. Drink it by the pitcher. Since tea contains no sodium, fat, carbonation, or sugar, it is virtually calorie free. To top it off, there are decades’ worth of research showing that the many bioactive compounds found in tea, called flavonoids, may contribute to overall health. *Note:This recipe uses 50 percent more tea than is used to make hot tea to allow for dilution by ice.